Denis Diderot explains how he can make marble come to life ‘whenever he pleases’ in an imaginary dialogue between himself and his friend Jean le Rond d’Alembert, mathematician and co-editor of the Encyclopedia. In the following passage he has just informed d’Alembert, much to the latter’s astonishment, that he knows how to make marble have “active sensitiveness” like that which is possessed animals and people. Diderot: How? I shall make it edible. d’Alembert: Make marble edible? That doesn’t seem easy to me. d’Alembert: Careful, please; that’s Falconet’s masterpiece! If it were only by Huez or some one like that –. Diderot: Falconet won’t mind; the statue is paid for, and Falconet cares little for present respect and not at all for that of posterity. d’Alembert: Go on then, crush it to powder. Diderot: When a block or marble is reduced to impalpable powder, I mix it with humus or leaf-mould; I knead them well together; I water the mixture, I let it decompose for a year or two or a hundred, time doesn’t matter to me. When the whole has turned into a more or less homogenous substance, into humus, do you know what I do? d’Alembert: I’m sure you don’t eat humus. Diderot: No; but there is a connection, of assimilation, a link, between the humus and myself, a latus as the chemist would say. d’Alembert: And that is plant life? Diderot: Quite right, I sow peas, beans, cabbages, and other vegetables; these plants feed on the soil and I feed on the plants. d’Alembert: Whether it’s true or false, I like this passage from marble into humus, from humus to the vegetable kingdom, from the vegetable to the animal kingdom, to flesh. 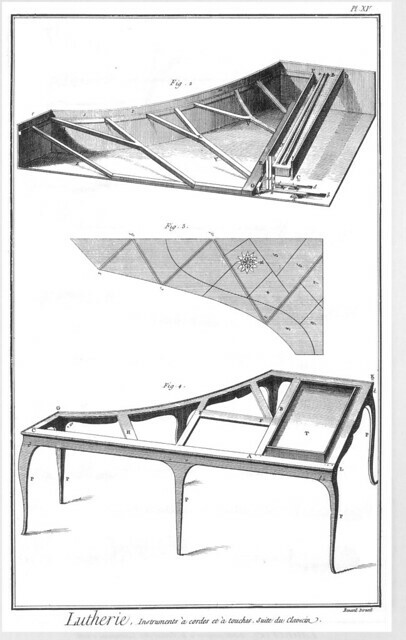 Later in the dialogue Diderot asks d’Alembert to imagine a harpsichord “endowed with the faculty of feeding and reproducing itself”, male and female harpsichords and “little harpsichords, also living and vibrating”. This entry was posted in intellectualhistory, philosophy, quotes and tagged Denis Diderot, Jean le Rond d'Alembert. Bookmark the permalink. Comments are closed, but you can leave a trackback: Trackback URL.